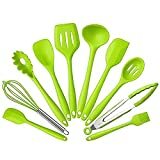 COMPLETE COOKING UTENSILS SET COVERS ALL KITCHEN NEEDS: Spoonula,brush,whisk,large and small spatula,ladle,slotted turner and spoon,tongs,pasta fork,perfect for all types of foods and cooking. HIGH HEAT 450 F SILICONE: Safe for coated & non-stick cookware, they simply won’t discolor,warp, melt or chip like your old plastic kitchen utensils or bamboo kitchen utensils. STAIN RESISTANT AND ODOR RESISTANT: Microwave, oven, freezer, and dishwasher safe, premium non-stick silicone is literally the easiest substance to clean,perfect as pastry paint brushes or bbq barbecue basting brush for weber grill. LIFETIME GUARANTEE! : If you’re not happy we’re not happy ! If we can’t make it right and you are not satisfied for any reason, we will gladly and promptly refund your purchase price.